Donbot talking to Clamps (6ACV14). The Donbot is the head of the Robot Mafia, and works alongside Clamps and Joey Mousepad. 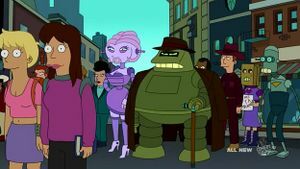 He is a green, fat, male robot, perhaps originating from Earth or Sicily 8, who is usually seen wearing both a brown hat and a brown jacket. The Donbot is the husband of Fanny and the father of at least two daughters, one of which is Bella. The Donbot hired Bender Bending Rodríguez to work as a goon to the Robot Mafia and steal a shipment of Zuban cigars (2ACV13), attempted to kill Flexo with an unbendable girder after Bender, disguised as Flexo, continued to flash his filthy scab money (3ACV06), was one of the FART (4ACV06), which shows that he is a parent, attended the Big Robot Party (4ACV08), and was a member of the League of Robots (TBwaBB). Fanny, his wife, cheated on him with Bender after Bender met her in the Gearotica Theatre (ItWGY). When the Robot Mafia became aware of the affair, they shot them and buried them a few times as a warning. However, the Donbot and Fanny had already gotten back together by the legalization of Proposition ∞ (6ACV04). He later had Clamps try to kill Bender again after Bender had testified concerning Donbot's assault on Calculon (6ACV14). His name refers to the fact that he is a crime boss and a robot. Donbot: Alright, here's the battle plan: We shoot, they surrender, we go aboard, somebody does some clamping, then we heist the cigars and go home. Donbot: Their desire to keep living shows me no respect. Hey, Blotto, roll down the window and start shooting. Donbot: That's the last of 'em. [Joey and Clamps walk back in through the linkway.] Alright, now let's Mafia things up a little. [He takes two oil containers out of his chest cabinet.] Joey, burn down the ship. Clamps, burn down the crew. Donbot: Yeah. That cash oughta be slushin' my fund and kicksin' my back. Donbot: Remember, only kill the one with the beard. That other filthy scab we got nothing against. Donbot and his wife, Fanny. This page was last edited on 15 February 2016, at 21:14.